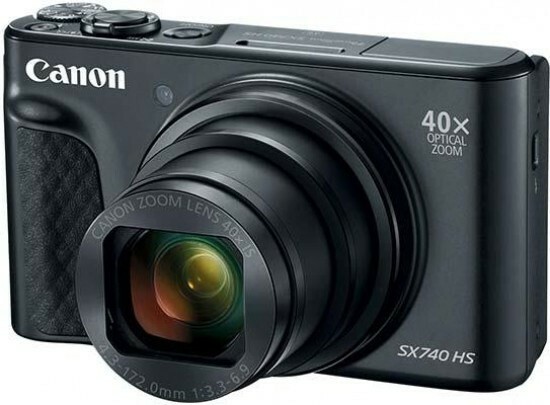 Canon have updated their new superzoom travel compact camera for 2018/19, the PowerShot SX740 HS, by adding UHD 4K video recording and faster 7.4fps burst shooting, thanks to the inclusion of the latest Digic 8 processor. In all other regards the SX740 is virtually identical to its predecessor, the SX730 model. It features the same 20.3 megapixel 1/2.3-inch CMOS sensor, 40x optical zoom lens which is equivalent to 24-960mm in 35mm terms, tilting-screen which is useful for taking selfies, and Bluetooth and Wi-fi connectivity. 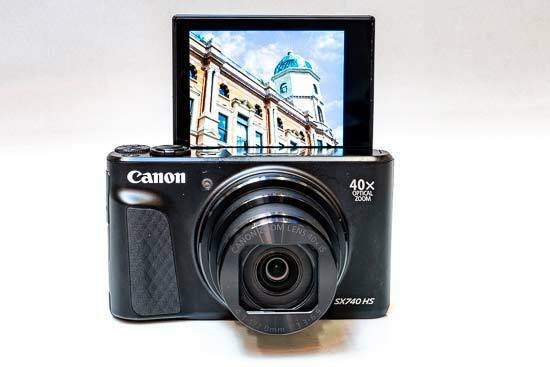 The Canon PowerShot SX740 HS is available in black or silver and retails for £399 / $399. Canon have updated the PowerShot SX740 HS for 2018 by incorporating the Digic 8 processor, which has two main benefits. It increases the burst shooting speed from 4.6fps with AF on the previous model to 7.4fps on the new one (or 10fps with the focus locked at the first frame), and it adds the ability to record video in UHD 4K quality at 30/25fps. Other than a couple of very subtle labelling changes to the exterior, the SX740 and SX730 models are otherwise identical, so we'd suggest that the sole reason for picking the latest and greatest version is the 4K video, which ensures that the SX740 can compete with similar cameras from other manufacturers. The SX740 is actually the first PowerShot camera to feature 4K video, and one of the few Canon cameras full-stop to offer it. Together with the 40x zoom lens and 5-axis image stabisation system, it's possible to capture some excellent 4K footage. 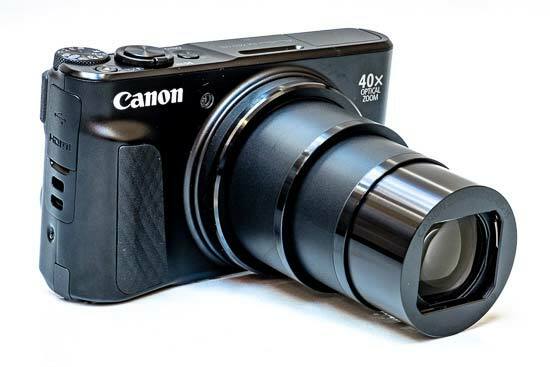 The Canon SX740 HS, like the SX730 before it, is an impressively slim camera considering the 40x optical zoom lens that it houses. On the front of the camera is a slightly protruding grip which has a rubberised texture on part of it to help it feel secure in your hand. Despite the big lens, you can still comfortably fit the camera into your pocket. On top of the Canon PowerShot SX740 HS is the shutter release, which is surrounded by the zoom switch. It feels reasonably sturdy, and zooming the lens in and out is quite a fluid movement - being neither too quick nor too slow. There’s also a video record button and an on/off switch. It can be all too easy to press the video record button when you’re first getting used to the camera, but Canon has placed them reasonably apart enough to get used to knowing where each one is. A dedicated shooting mode dial is also located on top of the Canon SX740 HS. Enthusiasts will be pleased to see a full range of semi-automatic and manual modes, such as aperture priority and shutter priority. There’s also of course a full complement of automatic options, including the interesting “Hybrid Auto” mode. This mode works by capturing a 2-second video before each shot is taken and compiling them together at the end of each calendar day. It can be great for holidays and events where you get a bonus video to accompany your images - on the downside, you can’t edit what appears in the video, which would be even better. Selfie mode takes advantage of the tilting LCD screen. This is found on the mode dial, and allows you to change the background blur and the amount of skin smoothing you want to apply to your image. You can apply skin smoothing in other modes, too, if you like, but it’s directly accessible here. Also on top of the camera is the camera’s flash which you need to use a small catch on the side of the camera to release when you want to use it. On the back of the Canon PowerShot SX740 HS, the buttons are grouped to the right hand side, which is beneficial if you’re using the camera one handed. The buttons are perhaps a little on the small side, which is something to consider if you have particularly large hands. They’re also slightly cramped together, which can make things a little awkward at times. There’s a scrolling dial, which is used for a variety of different things depending on the shooting mode you’re in. For example, if you’re working in aperture priority, moving the dial will alter aperture. You can also use it in playback to move through the images you have already taken. The scrolling dial also doubles up as a four-way navigational pad, with each of the directional keys having a specific function assigned to it. Up controls exposure compensation, left switches on manual or macro focusing, down changes the camera’s display, and right is used for altering the flash mode. Four more buttons surround the scrolling dial which have various functions. One of the most useful buttons is the Zoom Frame Assist button, which as mentioned has moved from the side of the camera to the back. It’s used when shooting at long telephoto lengths - if you lose sight of your subject, hold down the Zoom Frame Assist button and the lens will momentarily zoom back out until you find it again. Release the button and the zoom will return to the same focal length you were previously using. It’s a great way to keep track of subjects at the longer focal lengths, especially if the subject moves. 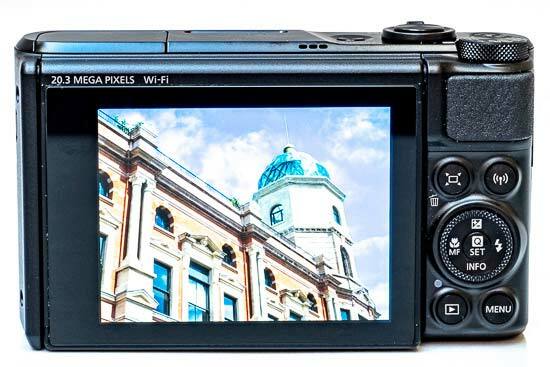 Another button gives you direct access to the Canon SX740 HS’s Wi-Fi settings. The first time you press it, you’ll be asked to set-up the camera ready for connection. Once connected you can send images across to your phone for quick sharing, or remotely control the camera from your phone. That makes it useful for group shots or perhaps even some awkward angles. You can also pair with your phone using Bluetooth, which means that an always-on low-powered connection will be maintained. You can use this to remotely control the camera, but you’ll need the higher power of Wi-Fi if you want to see a live view output to your phone. Note that Canon have removed NFC connectivity from the SX740. The final two of the four buttons are the playback button, and the main menu button. There’s also a central button in the middle of the navi pad which has a couple of useful functions. If you press it when in normal shooting mode, you’ll bring up the “function” menu, which acts as a quick menu, giving you access to a number of different settings that you might want to change reasonably frequently, such as ISO speed and white balance. The central button can also be used as a confirmation button for certain settings. Unfortunately it’s not possible to customise the camera to assign different functions to different buttons. Despite offering full manual control, there are a couple of let-downs for enthusiast photographers here with the Canon PowerShot SX740 HS. For a start, it’s still not capable of shooting in raw format, disappotinting given how well-appointed the rest of the camera is, and it even loses the super fine JPEG compresssion setting that its predecessor offered. Secondly, there’s no option to change the focus point. For AF modes you can choose between Face AiAF, Tracking AF and a single frame in the centre. The latter means you need to focus and recompose if you want to photograph something on the edge of the frame. 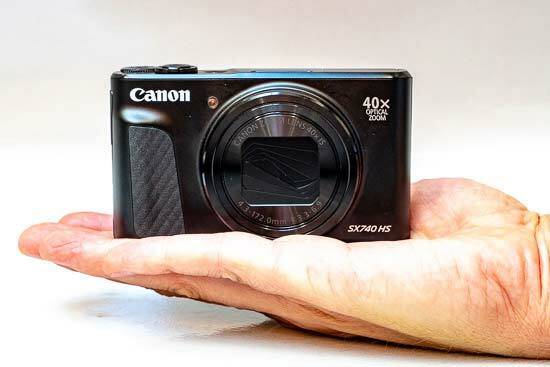 Due to the physical length of the 40x optical zoom lens, the Canon PowerShot SX740 HS takes a couple of seconds to start up and be ready to shoot. If you have plans to take a lot of shots in quick succession, you’d do well to leave the camera switched on. Otherwise, the camera is very quick in operation, moving through images in playback with no hesitation. Autofocusing speeds in good light are very quick, dropping a little as the light darkens, but there’s an AF assist lamp on hand to help with that if you’re shooting somewhere very dark.